With 2018 creeping closer, we’ve been reminiscing about what a great year 2017 has been for us at Jarrods. Whilst we’re excited about the future, we’re particularly proud of everything we’ve achieved in 2017. It’s been one of our most successful years to date, and none of that would have been possible without our amazing customers. As such, we’re taking a look back at some of the best staircases we’ve created in 2017. Mr and Mrs Penfold built their own home back in 1998, so it obviously has a huge place in their hearts. Yet, as time had passed, they wanted to modernise the interior whilst ensuring their personalities still shone through in the design. 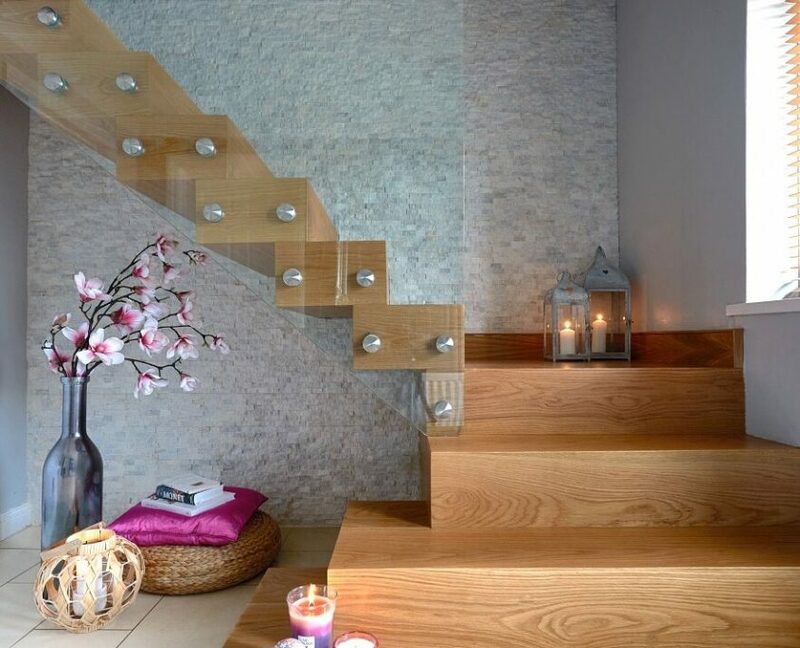 They approached us to help them to create a bespoke staircase that could act as the focal point of their home. The Penfolds original staircase was made of pine which was starting to look a little dated. 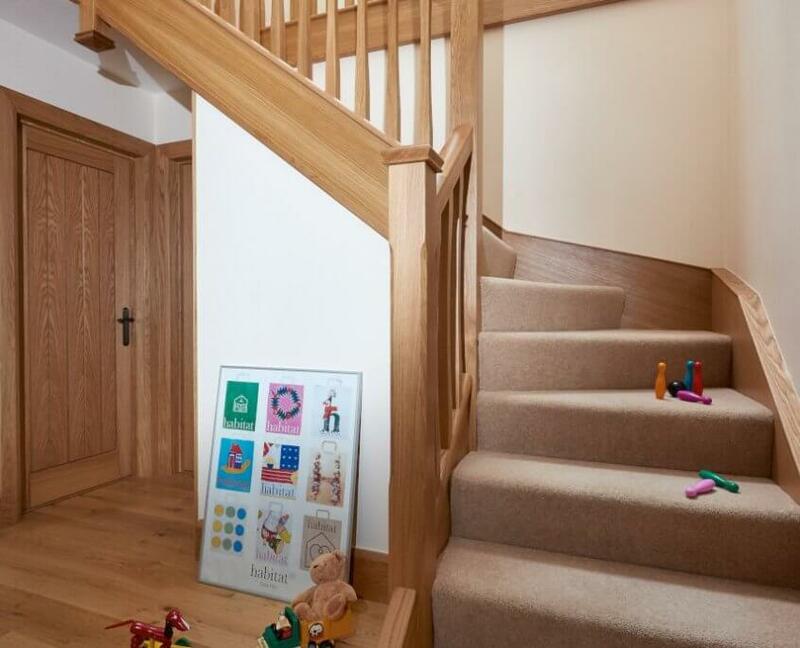 We used the original structure, but the new modern oak staircase gives a far more contemporary look. We also gave the internal doors, skirting and architraves a whole new look with matching oak. Previously, the Armstrongs had some unused understairs space that was going to waste. 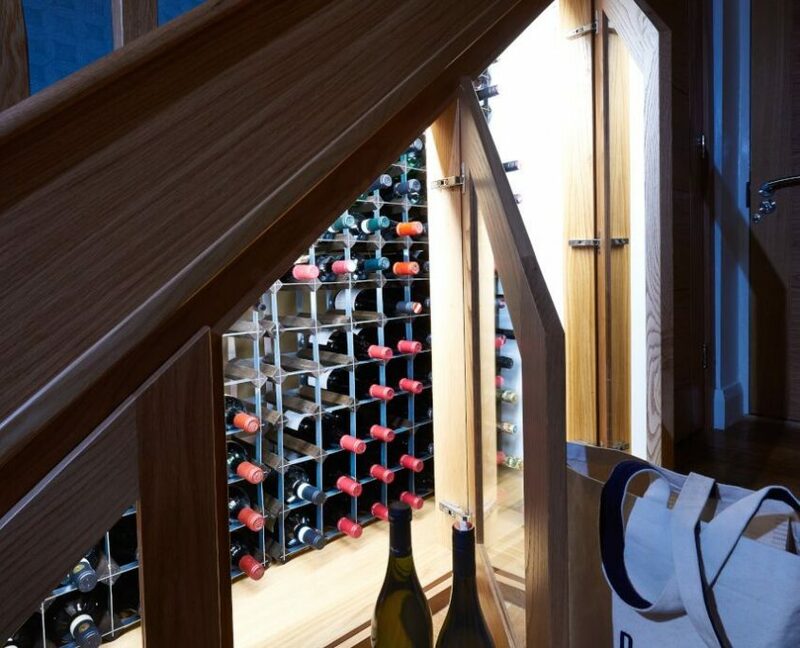 The new staircase gave them the opportunity to truly maximise this space, and as such, they opted to create a wine storage area! We made this a real feature to showcase the couple’s impressive collection of wine. We understand that some people are very private about their homes, so we always strive to protect that privacy. One couple we worked with didn’t want to be named, but they were keen to share their experience anyway. The couple in question had a large hallway that benefited from some great natural light, but they wanted to truly maximise this. Using a combination of oak and glass, we created a sleek, modern look with a contemporary and minimalistic staircase. The hallway naturally feels far more open and light feel due to the reflective nature of the glass. The Hands set us quite the challenge by asking us to create not one, but two new staircases for their home. With this project, it was important to ensure there was an element of consistency between floors. 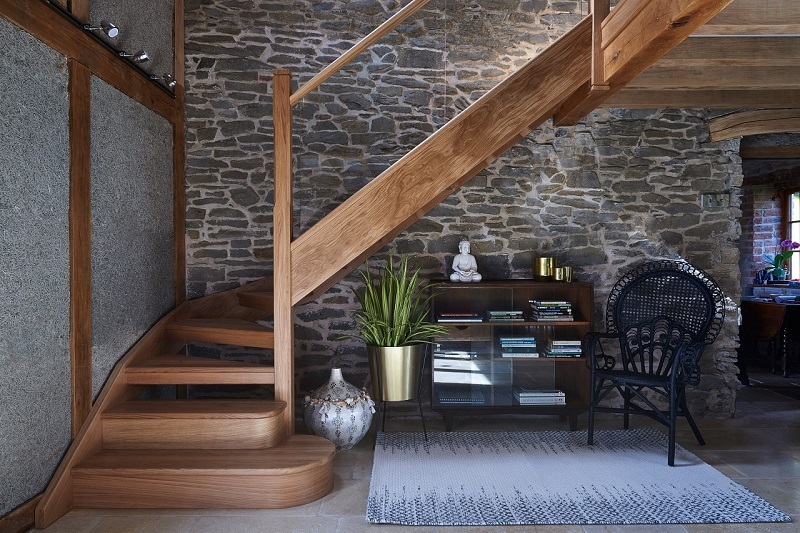 Both staircases are now far more modern, combining sleek glass with natural oak to allow as much light as possible to flow through the house with a heightened sense of continuity. The Morris family approached us to help them when they were working on a double-storey development project on their home in Mid-Wales. There was just one catch… there was no existing staircase at all for us to make a start with! Fortunately, that’s not an issue for us and we got to work straight away to create something which was in keeping with the eco-design of the extension and sensitive to the interior concept. 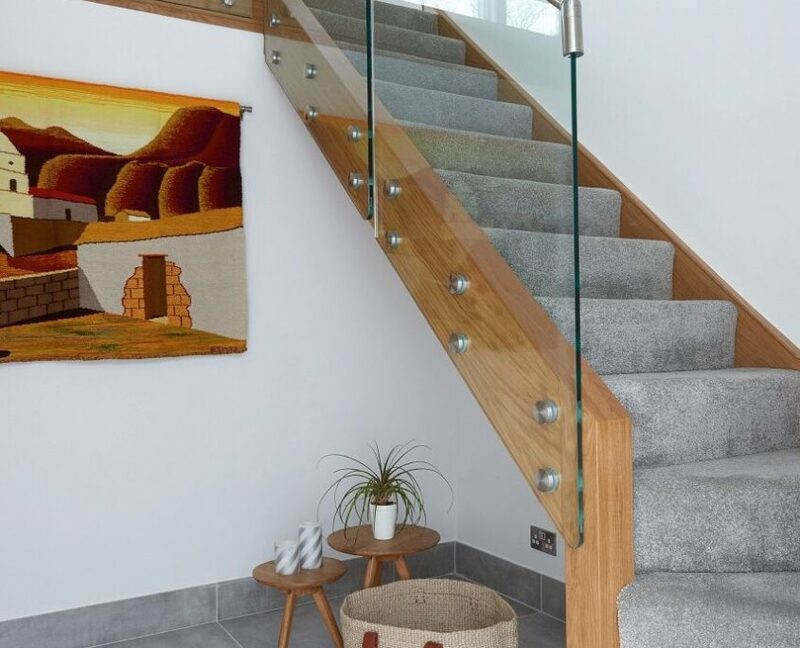 In order to complement the look and feel of the cottage and its new extension, we decided to build the staircase itself from oak and safety glass. The end result is something that not only looks stunning but perfectly fits in with the rest of the property. Making interior changes to Grade-II listed buildings can be tricky, but we’re not afraid of a little hard work at Jarrods. 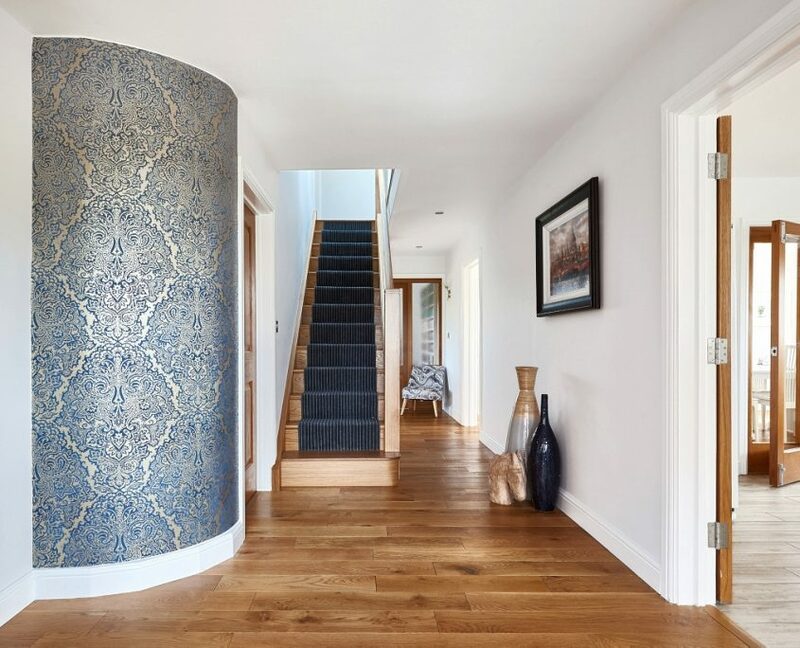 When the Donohoes approached us with a very specific idea of a staircase design that they wanted to introduce to their listed home, we were intrigued. The Donohoes wanted a ‘hit-and-miss staircase’. For those who don’t know, a ‘hit-and-miss’ staircase stretches the entire width of the stairwell, with the treads following a normal pattern on the left but every other step is missing on the right-hand side. We love a challenge, so we couldn’t wait to get started on this one. And we’re sure you’ll agree, the end result shows that our hard work paid off! Mrs Harvey often felt like something was missing when it came to the interior design of her home. 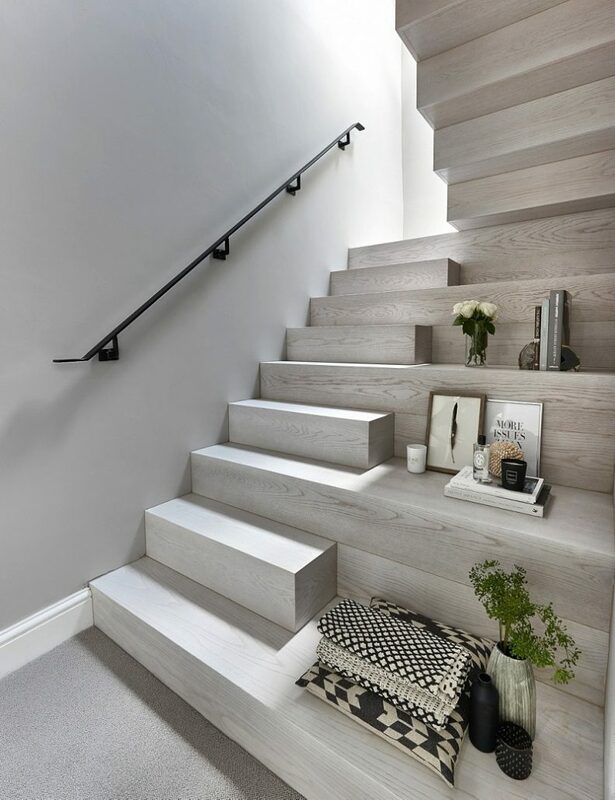 Eventually, she realised that she wanted to make an impression on her visitors from the moment they set foot in her house, and a feature staircase was just the way to do that. 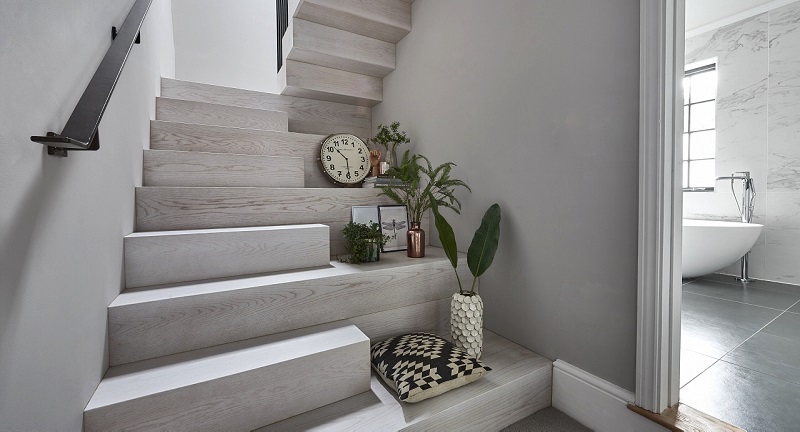 If you’re interested in a staircase renovation or have a project in mind, get in touch with our team to get started on your very own customer story!